We are pleased to offer short courses in the art of preparing fine Thai cuisine at our special cookery school in Bangkok. 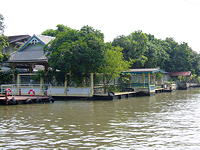 In a lovely old waterside house in a small compound occupied by the same family for generations, this home-style Thai cooking school lies in a quiet location on a canal in the historic Thonburi area of Bangkok. If you are staying at a riverside hotel, we will collect you by boat for the trip to the cookery school, if not then we will transfer you first to the boat pier by road, and then onward by boat. A unique feature of this school is the herb garden - here you can learn about the many flavours of Thai cooking and pick the herbs you need for your cooking! The courses that we offer are completely hands on and conducted in English, students will be provided their own cooking station and utensils to prepare and cook all 4 dishes by themselves. The classes are limited to a maximum of ten participants to ensure individual attention for everyone. 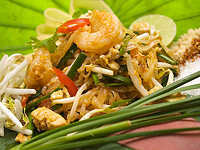 Our instructor and her assistant have an an extensive knowledge of Thai ingredients and cooking methods and will demonstrate how to cook the dishes first and let the students taste what she has prepared. At the same time, she will give students lots of extra tips about alternative cooking methods and substitutes for each dish which she takes pleasure in sharing with her students every day. She will be carefully guiding students while cooking through the recipes step-by-step with the main emphasis on quality, information and fun. Each half-day lasts about 5 hours from pickup at your hotel to drop off. (08:00-13:00). There are three rotating menus, one per day, each with 4 courses and the school operates 6 days a week (closed Wednesday).